This article contains all the information an amateur gardener needs to grow top quality tomatoes outdoors in the UK. The unique calendar below can be personalised to the weather conditions in your area of the country (click here to do that now). The default setting will be average UK weather conditions. For all the tomato varieties which we have fully reviewed, click the drop down box below, select a variety and then click the More Information Button. Whichever method is chosen, tomatoes benefit from as much sun as they can possibly receive in the UK. Tomatoes will grow in partial shade although they will produce less of a crop and it will be later in the year. Tomato plants also prefer positions protected from winds. If you are growing tomato plants in open ground, dig the soil well and add lots of well-rotted organic matter. You are aiming for a free-draining but water retentive soil. A couple of weeks before planting out your tomatoes sprinkle a good handful of blood, fish and bone per square metre (yard) over the soil surface and gently work it in with a rake, hoe or similar. Grow bags and multi-purpose compost should have sufficient nutrients already in the compost to feed your tomato plants for four weeks. Always use fresh compost bought in the current year, old compost and grow bags used last year will have pests and diseases in them which will almost certainly do damage to tomato plants if used again. Containers and grow bags must have drainage holes in the bottom and this is often not the case. Check for drainage holes well before planting because it is very difficult to add them later on. 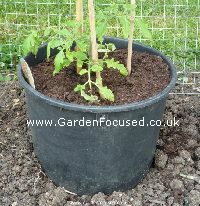 For our detailed article specifically about growing tomatoes in containers, grow bags and raised beds, click here. Some basic rules need to be followed when sowing seeds. First, tomato seeds require a soil temperature of at least 10°C / 50°F to germinate and above 35°C / 95°F they will fail to germinate. The best temperature range is between 18°C / 64°F and 22°C / 72°F. A small fall in the temperature at night time is perfectly acceptable although the more even the temperature the quicker the seeds will germinate. In the UK it's almost impossible to achieve the optimum soil temperatures for germination early in the season wherever you live, so we strongly recommend sowing and growing on the seedlings indoors. It's important to get the timing of sowing tomato seeds correct because you can sow them too late and end up with a late crop, or, you can sow them too early and end up with a houseful of large, light-starved plants just waiting for the last frost before you can plant them out. 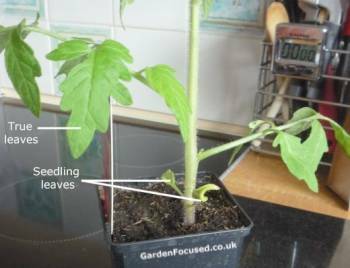 We recommend sowing tomato seeds in 7cm / 3in pots initially, anything smaller and you will need to pot up (transfer the seedling to a larger pot) more frequently with no benefit. The best time to sow tomato seed in average UK areas is the second week of March 2015. Click here to personalise dates in the site to your town. Fill the pots nearly to the top with multi-purpose compost, place one or two seeds (depending on how expensive they are) on the compost surface and then lightly sprinkle a centimetre more compost over the seeds. Gently pat the compost down over the seeds and water, preferably by placing the pots in 3cm / 1 in of water until it is damp through. Place the pots in a warmish area of the house (18°C / 64°F and 22°C / 72°F), with or without light, it doesn't matter at this stage. The seeds will take one to two weeks until they germinate and a seedling appears. As soon as that happens move the pots to a light and airy position such as a windowsill but not in direct sunlight. At this stage aim to grow them on in a temperature of around 18°C / 64°F - small differences in the temperature are not a problem. However, as always with growing plants on a windowsill, be aware that occasionally night time temperatures can get low and the plants will not withstand much lower than 6°C / 43°F without ill effects and a frost will kill them them stone dead. If you are growing on a windowsill where the light only comes from one direction you will find that the plant bends towards the light. To even the plant's growth up turn the pot halfway round every day or so. 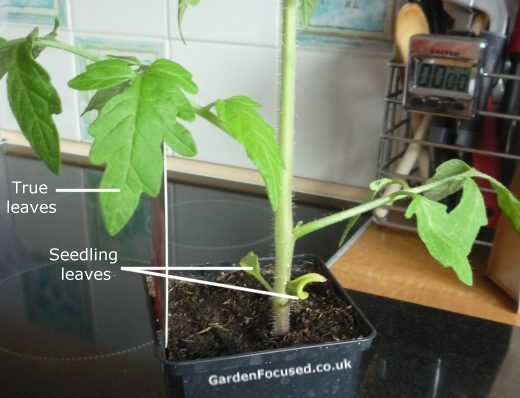 If you want to know how to save tomato seeds, our seven step guide with pictures is ideal. It's easy to do, costs nothing and above all it's fun and environmentally friendly. Click here to go to the page. 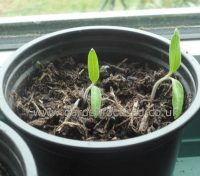 Roughly four weeks after sowing tomato seed in 7cm / 3in pots the plants will need to be transferred to a larger pot to allow more room for the roots to grow. If you follow our advice on the timing of sowing seed we recommend potting up the plants into 12cm / 5in pots although a centimetre or two more will be fine. 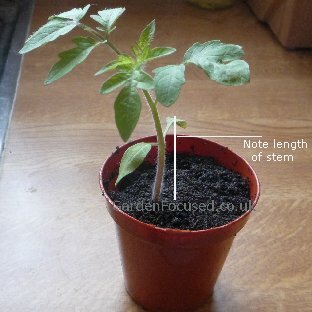 To judge when to pot up tomato plants, they should be about 10cm / tall. 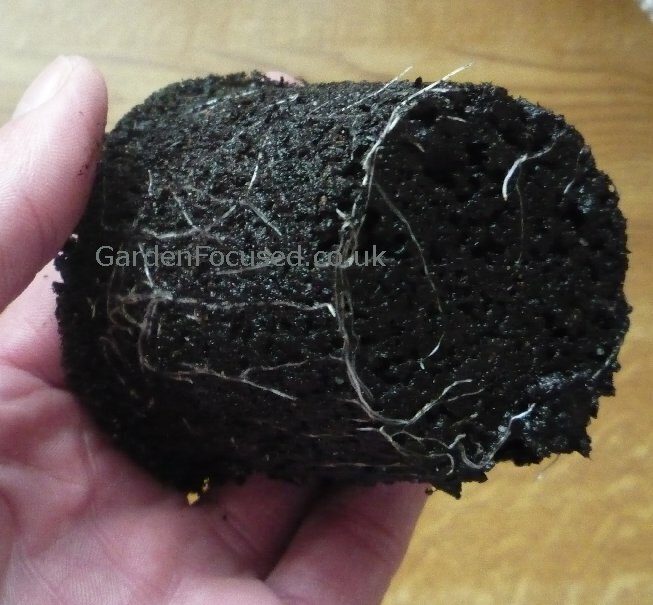 More importantly, the roots should have reached the base of the existing pot, see the picture below. Turn the plant and soil out of the old pot into the palm of your hand. 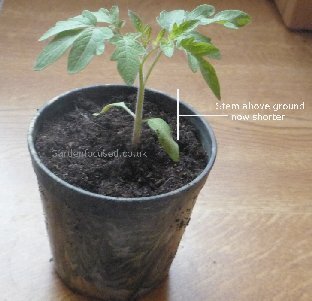 Carefully place it centrally into the new pot, do not add any compost to the base of the larger pot before doing this. Now infill the space in the new pot with more compost, gently firming it down as you go. If you follow these instructions on potting up you will find that the tomato plant is slightly deeper in the compost compared to before and this is ideal. This will allow the stem to sprout new roots higher up the stem and ...... more roots mean more tomatoes at harvest time! The same principle will apply when you plant the tomatoes into their final positions. The new compost will provide enough nutrients for the next three weeks but after that feed them with a balanced liquid fertiliser once a week at the rate recommended on the packet / container. Keep turning the pot around to ensure light reaches all sides of the plant and it grows upright rather than towards the light. A week or two before planting out your tomatoes you will need to acclimatise them to outside temperatures and weather conditions, this process is called hardening off. Start this off during the first week of May by placing the plants in a protected position outside during the day for a couple of hours at first. Day by day increase the amount of time they spend outside by an hour each day. Always bring them inside if a late frost threatens. 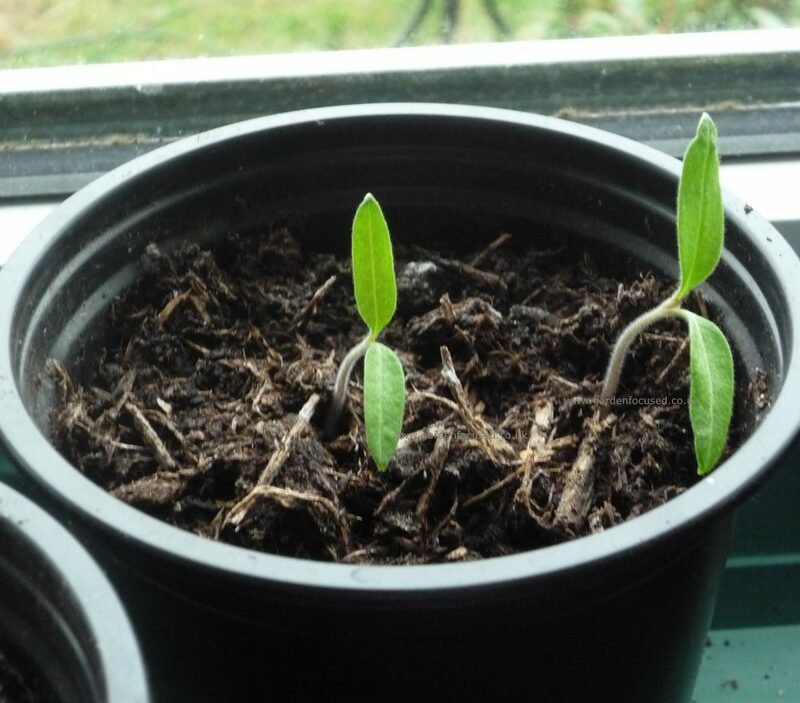 When tomato seedlings first grow they have two leaves (called cotyledons), see the picture above here. These leaves are specially designed to protect the growing tip as the plant pushes to the surface. When they reach the surface and sense light the plant immediately begins to produce normal leaves which are designed to convert light into energy and enable the plant to grow a root and canopy system. As the plants grow and develop true leaves the seedling leaves have no purpose any more so they turn yellow and eventually fall off of their own accord. You can of course gently pull them off as soon as true leaves develop. The point being made is that yellowing seedling leaves are completely natural and nothing to be concerned about. If more lower leaves start to turn yellow then that is a concern. The normal reason for yellowing leaves on tomato plants is that there is a shortage of nitrogen. To correct add a balanced general purpose liquid fertiliser to the water when you water the plant. The frequency and amount are as stated on the packaging. Another reason for yellowing leaves is that the plant is simply too big for the pot and needs to be potted up. If a large plant is grown in a small pot the roots are not able to absorb sufficient nutrients to support the above ground growth and the leaves may start to turn yellow. Another possible reason for yellow tomato leaves is that the compost is water-logged. This also stops the roots absorbing nutrients and causes yellow leaves. The solution is to stop watering for a short period of time. Only plant out your tomatoes when all danger of frost has passed, in average UK areas this is the third week of May 2015. Click here to personalise dates in the site to your town. If you are planting them directly into open ground prepare the soil by digging it to a fine tilth to a spade's depth. Sprinkle a handful of blood, fish and bone per square metre / yard onto the planting area and work it into the soil surface. Tomato plants prefer a soil which is slightly acidic although they will grow successfully in most garden soils. The ideal pH would be in the range 6.0 to 6.8. A neutral soil has a pH of 7.0. Click here to learn more about soil pH levels. The procedure for planting is the same for grow bags and in open soil. Use a trowel to dig a hole slightly wider than the pot and about 5cm / 2in deeper. Place the plant in the hole and infill with the surrounding soil / compost gently firming it down as you go. The plant will end up 5cm / 2in deeper below the soil surface than before allowing the newly buried part of the stem to sprout more roots as the plant grows. Water in well to settle the soil around the roots and also provide initial moisture. 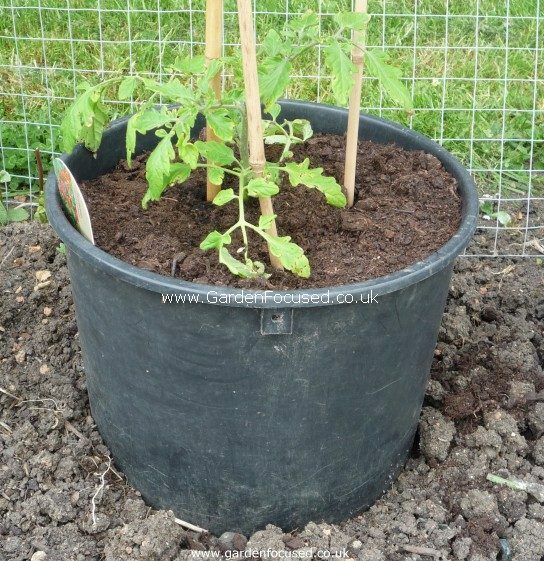 One good idea for planting out tomato plants in grow bags, pots and in open soil is to use a bottomless container filled with compost. 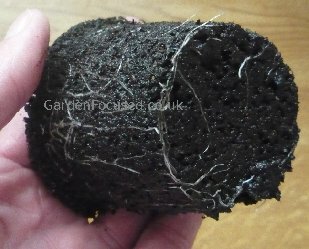 The picture below (click it to enlarge and see more clearly) shows a bottomless pot (we simply cut the base off with a sharp knife) filled with multi-purpose compost. The pot is placed over prepared open soil but can just as easily be placed into a hole cut into the top of a grow bag. When planting in open soil this gives the young tomato plant an ideal soil into which it can initially establish itself. When the roots reach the base of the pot they will grow easily into the normal soil. The benefits for using the same system with grow bags is that the tomato plants have a larger area to spread their roots and absorb nutrients, it also reduces the need for frequent watering. Allowing enough space between plants is important to permit good airflow and reduce the risk of fungal diseases such as blight. The space depends to a great degree on which variety of tomato plant is grow so follow the instructions on the back of the packet of seeds. A spacing of 45cm to 60cm (18in to 24in) between plants should be fine in most cases. Cordon tomato plants will need support during the growing season. Where they are grown in open ground a single stick can be inserted into the soil near the plant. Allow for 1.2m above ground and about 50cm below ground. Tie the main stem into the support as it grows. The same can be done for plants grown in grow bags although commonly the are grown against a fence which can sometimes be used to provide support.